Save 20% ! We are closing our Store and only have limited quantities of this book remaining. This thoroughly readable, research-based book covers all the bases—including, social, neurological, emotional, academic, cultural and physical factors that impact the emotional climate of a school, and how safe schools feel to the people who spend their time there. Discover the many contributing factors in this groundbreaking sourcebook on emotional safety in schools, with research, facts, and personal anecdotes capable of changing the state of education. Read the Rave Reviews for Creating Emotionally Safe Schools! 6” x 9,” 496 pages, $13.00 (Save 20% off retail price of $14.95). Use your credit card or PayPal account to order Creating Emotionally Safe Schools through a secure server online. Ask for an autograph. It’s free, too! The many factors that impact the emotional climate of a school, with research and practical ideas for making schools safe for everyone. 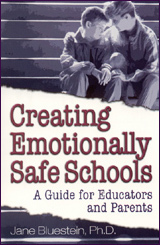 View the entire bibliography of Creating Emotionally Safe Schools. I work with Jo Ann Freiberg at the CT State Department of Education. We are looking to order 150 of your Creating Emotionally Safe Schools. Are you able to accept a Purchase Order for them? What would be the cost for 150 books that we will use to give to school staff who attend the Improving School Climate trainings that the CSDE provides?